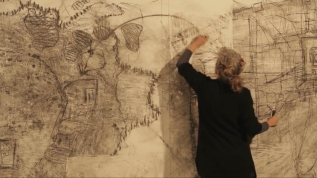 “Borderline” is the title of two performance events featuring new works that address the space of the former Hansen leper house, and engage with cartography, mapping, and drawing in space. Cartography, as a field of knowledge that encodes the space and delineates the connections between space and identity, employs the language of drawing in order to express political, economic, and social worldviews, all the while preserving and founding perceptions of identity. The works in “Borderline” will offer a different mapping of the space, whether through a revised reading of existing maps or the creation of alternative poetic maps.